POXEPLATE® NOVOLAC Chemical Resistant Epoxy Flooring installations consisting of several thousand square feet can be installed, cured, and ready for use during a weekend eliminating costly down time. The physical and chemical resistant characteristics of POXEPLATE® NOVOLAC Chemical Resistant Epoxies are substantially greater than concrete and most other types of specialty flooring systems. 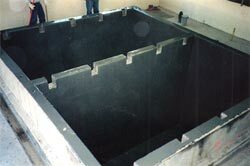 Installations may include flooring, cove bases, containment walls, room walls, sumps, pits, curbs, foundation pads, and any other area where chemical-resistant is required. The cost of a POXEPLATE® NOVOLAC Chemical Resistant Epoxy installation is far less than most other types of chemical-resistant surfaces, such as acid-brick. The qualities offered by Epoxy flooring exceed those of acid-brick or most other types of specialty flooring. Alkalies Ammonia, soda ash, caustic potash, lime. Mineral Acids Phosphoric, hydrochloric, sulfuric. Organic Solvents Turpentine, thinners, petroleum. Organic Compounds Sugar, mineral oils, soaps, detergents, greases, milk, fruit, cheeses, beverages, animal and vegetable fats. POXEPLATE® NOVOLAC Chemical Resistant Epoxy is a two component, 100% Solids Chemical Resistant Epoxy, containing no solvents, formulated with dehydrated clean, and specially graded silica, oxides, glass beads, or other aggregates to form a workable matrix that is applied over a prepared concrete or wood floor in thickneses of 1/8" to 1/4", or as required, and finished to a smooth or non-skid floor texture. POXEPLATE® NOVOLAC Chemical Resistant Epoxy is a maximum duty, high chemical-resistant flooring product that can be applied as a 1/8" to 1/4" topping or a 15 to 100 mil coating. Application thicknesses may vary due to jobsite conditions and requirements. This product can be used wherever the existing floor is in a worn and deteriorated condition resulting from severe chemical attack or heavy-duty traffic. Primarily, POXEPLATE® NOVOLAC Chemical Resistant Epoxies are used to protect concrete or wood surfaces against deterioration from direct chemical attack, spillage or traffic. The base to which POXEPLATE® NOVOLAC Chemical Resistant Epoxies are to be applied must be firm and dry. All concrete areas containing ruts, voids, major holes and major depressions can be grouted using POXEPLATE® NOVOLAC Chemical Resistant Epoxy Grout. Wood floors that are loose and splintery must be repaired, and when required, covered with securely fastened plywood prior to proceeding with the new Epoxy applicaton. Concrete floors must be cleaned. All loose and deteriorated surface materials must be removed, and the entire floor prepared by scarification, shot-blasting, grinding, or other like means. POXEPLATE® NOVOLAC Chemical Resistant Epoxy Primer is applied to the floor. POXEPLATE® NOVOLAC Chemical Resistant Epoxy Flooring is mixed and applied to the floor at a thickness of 1/8", 1/4", or as required, and troweled or broadcast to a smooth and even floor surface. POXEPLATE® NOVOLAC Chemical Resistant Epoxy Finish Coatings/Sealers are applied in either one or two finish coatings to a smooth or non-skid surface texture. Detailed mixing, application, coverage, timing, and other application details will be provided when actual jobsite requirements are determined. POXEPLATE® NOVOLAC Chemical Resistant Epoxies are available in basic Grey color shades. Other colors are available depending upon chemical resistant requirements.